The Opal South division just happened to have the two finalists from last season’s clash. With all the action kicking off in Coventry, here’s the 5 things we learned! The defending champions put in a strong performance in week one, and really no-one should be surprised. 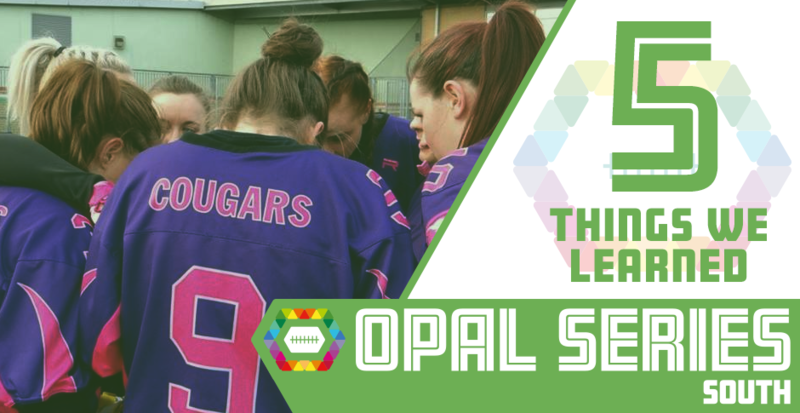 Their dominating win in the final of last year’s Opal Series put the exclamation mark on a stellar season, and they carried that momentum to a 2nd overall finish at Big Bowl. Their continuity is a huge reason for their success, as they have a strong sense of camaraderie. Successful excursions to tournaments such as Britbowl only builds on that, and the Cougars looked better than ever in game-day one. A margin of victory averaging 58-4 already has us locking the Cougars in as the likely top seed from the south. 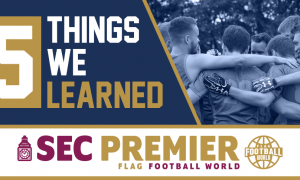 The Hyde Park Renegades were arguably the story of the 2017 Opal Series, with their talented cohort getting all the way to the Opal Series final in their debut season. They managed to scalp the Cougars during the regular season, before falling heavily in the rematch for the title. A 58-6 loss would obviously be disappointing for the Renegades, but they emerged 2-1 after a game-day where they only had 6 players. They need some bodies to return soon in order to be competitive. With the players available, they also need to cut out costly errors and play some mistake-free football in the meantime. Up 20-6 at the end of the first half against the Cougars Juniors, an ill-advised interception resulted in a Cougars score. On the first drive of the second half, another interception led to the Cougars having the opportunity to tie it up. On the next offensive play, a safety for the Cougars gave them a chance to win it, before the Renegades managed to seize back control and scrape by, 32-27. The Black Widows have been a mish-mash of talent from other teams for a number of years, taking part in invitational tournaments and posting strong results. Generally, if you need a team for a tournament that your own side isn’t competing in, you can hook up with the Widows for some valuable game-time. This year, they’ve decided to enter the Opal Series, taking some GB talent into the South Division to compete for a playoff spot. Their bid started well, as they went 3-1 on the first day of action. There’s no doubt they’ve got the talent to succeed, but their 52-0 loss to the Cougars was a stark reminder that they’ll struggle to compete against established, cohesive teams. The Warwick Wolverines have returned to the Opal Series, but they were handed 3 losses in their re-debut. Previously, the Wolverines had boasted GB talent and been regular participants in international tournaments such as Big Bowl. Their 0-3 start was a slight surprise to us at FFW HQ, however they’ll likely have a stronger squad at their next outing; their recruitment drive was cut short by the earlier start to the Opal Series, and we anticipate that they’ll have added some rookies during the gaps between weeks one and two. 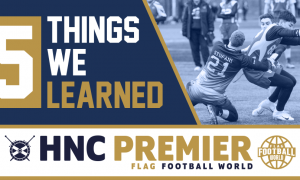 The Portsmouth Dreadnoughts spent much of 2017 on the wrong end of results, as they put two sides into the league – the Grey and Blue sides. 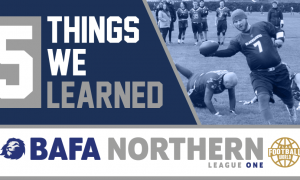 This year, they’ve put in a joint effort, and the first game-day was promising; The Dreadnoughts are currently 2-1, as they defeated the Wolverines 15-6, and the debuting Saxons 31-6. Their loss to the Black Widows showed they’ve got some way to go, but it’s positive to see progression from the Portsmouth team from their 2017 effort.